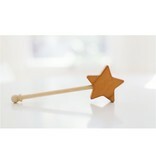 Our chunky star wand is the perfect toy for your little one to play with! Encourage imagination! Handcrafted from Cherry wood with a maple handle, this wand is sure to bring lots of fun for your little ones. The star measures approximatley 3", and the wand itself is about 6" long.